Repair Café Fairfield is a neighbourhood initiative that promotes repair as an alternative to tossing things out. Residents of Fairfield and surrounding areas can bring their broken items to fix them on the spot with the help of voluntary repairers. 10:00am – 1:00pm, Fairfield Community Place, 1330 Fairfield Rd. Check out all the stuff you can get fixed! Repair Café Fairfield could use more handy volunteers in the area. Help out day of, or behind the scenes…. 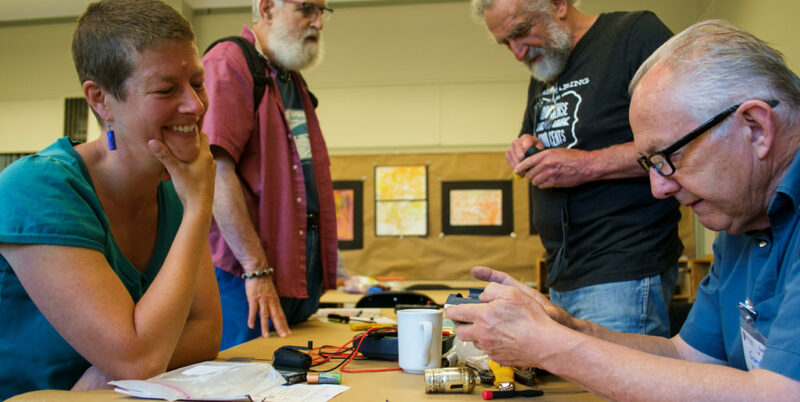 What is the Repair Café Fairfield? The Repair Café Fairfield is a free community event to which people can bring their damaged items from home to be repaired by volunteer “Fixers”. It’s also a chance to learn, with like-minded folks who believe in reusing instead of just discarding still-useful goods into the landfill. You can watch and even help, while enjoying a cup of tea or coffee. It is a positive, friendly and interesting experience for all. It is also part of an international movement. The Repair Café concept originated in 2009 with Martine Postma, who organized the very first event, to which dozens of residents brought their broken items, to a theatre in Amsterdam. This early success prompted her to launch the Repair Café Foundation in 2011. There are now 1,100+ Repair Cafés in 27 countries, spread across six continents. Where is the Repair Café Fairfield and when is it held? The next Fairfield Repair Cafe will be held on October 15, 2016 from 10:00am through 1:00pm at the Fairfield Community Place. What kinds of things can be fixed? LOTS! Electrical appliances, clothing, furniture, crockery, housewares, bicycles, toys, mobile phones and tablets, hearing aids, etc. Anything that’s broken (and which you can manage to carry) is welcome and has a good chance of getting properly repaired. If you want to be certain whether someone will be available to help mend a particular item, check our Facebook page a few days prior to the event or get in touch with us at repaircafefairfield@gmail.com. Large appliances such a stoves are not practical to repair at this 3-hour event. Do I need to bring any tools or supplies? You don’t have to bring tools, but if your item requires a light bulb or battery, please bring one along (& make sure it works first J). No. The Repair Café is free. How great is that? Nevertheless, voluntary donations that help fund repair supplies and refreshments are appreciated! What if my item needs a part? The Repair Café does not have a large amount of spare parts in stock. Small things such as switches, plugs, wire, thread or darning wool are often available. For other supplies, visitors will usually be given advice on where to buy the material in question. (Home Hardware is just down the street at the Fairfield Plaza). It might then be possible to mend the item later on during the event or at the next one. No. When you arrive at the event, you will be asked to fill out a short form that helps us keep everyone’s repairs organized. You then just wait your turn, while enjoying a cup of tea and chatting with other visitors. Due to the Moss Street Market event which runs concurrently, car parking is limited around the Fairfield Community Place. Consider riding a bike, walking or taking the bus instead. Bus #7 runs right by the Fairfield Community Centre, stopping at Moss St. Route #3 runs nearby along May St, while the #1 route runs along nearby Richardson. Sure! We hope to have a kid’s table set up with toys and other playthings. Yes. There is a wheelchair ramp at the main entrance. There are also washrooms. Can I bring more than one item? Yes. However, if there are others waiting their turn, your additional items may be repaired later during the event. It depends. Fixers can usually make an assessment within a few minutes, with most repairs then taking 15 minutes to half an hour. If an item requires a more lengthly repair, and there are others waiting their turn, you may be asked to make other arrangements. Can I drop something off and pick it up later? Sorry, no. You will need to stay with your item. An important part of the Repair Café is learning about fixing. Are there other Repair Cafés in the region? My item is too heavy to bring to the event. Do you also make house calls? No, sorry. You can always ask one of the Fixers at the event. Who knows? Maybe somebody would be glad to help you out. What can I do if my item can’t be fixed? A handy reference guide is available at the event which directs you on recycling or disposing of many items. For example, small appliances and electronics can be taken for free to the Bottle Depot downtown at 655 Queens. Sure, we accept donated tools and supplies. Contact us to find out our specific needs. We would love your help! Contact us to find out that volunteer positions are available.